I am currently spending the week at my parent’s house with Tallulah which means craft party in the USA. Last time I was here visiting my mother was on a shell mosaic bender, this time around it is all about the recycled robots. No piece of metal is safe around these parts. I witnessed her tear apart an innocent vegetable steamer for her art with the ferocity of a hungry jungle cat jumping on it’s prey. Of course, I too caught junk-bot fever and had to join in the fun. 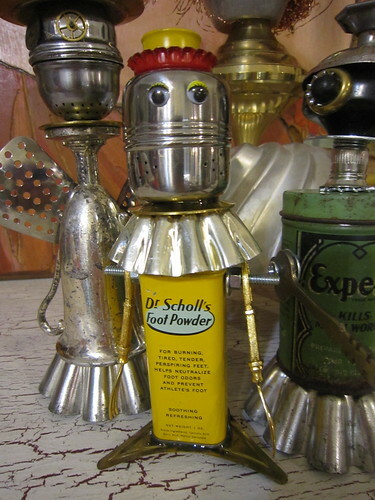 One vintage can of Dr. Scholls foot powder later I too find myself looking at silverware and tea balls in a whole new light. 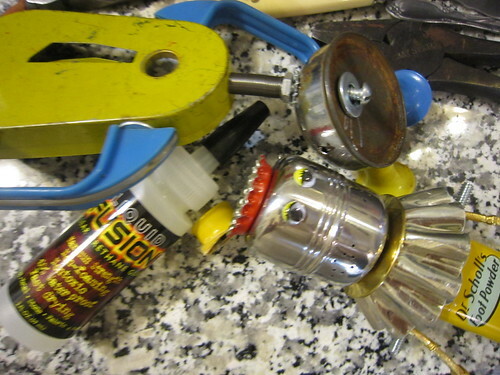 You might be surprised by what you have lying around your own house to use on your robot. If you are low on supplies it’s nothing a quick trip to the thrift store can’t fix. 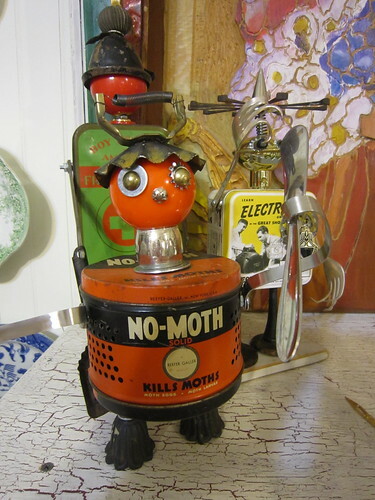 Look for old tins, metal measuring cups and spoons, defunct cameras – what you use on your robot is completely up to you. The fun part is deciding how you are going to put together your recycled rubbish robot. Some parts were glued in place using Liquid Fusion Glue like his little red bottle cap hat and google eyes. 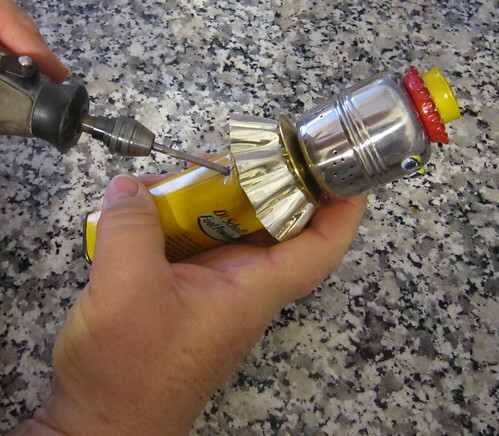 Other parts like the arms made from olive picks were attached by drilling through the tin then attaching with nuts and bolts. Just when I finally get my studio clean another hobby comes along. 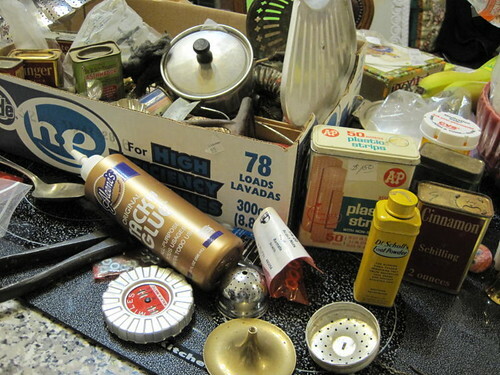 Of course it involves hoarding random junk, which I need like a hole in the head. Since when has that ever stopped me? I do after all have a few empty plastic bins left from all my organizing and cleaning begging to be filled up with metal junk for future robots. 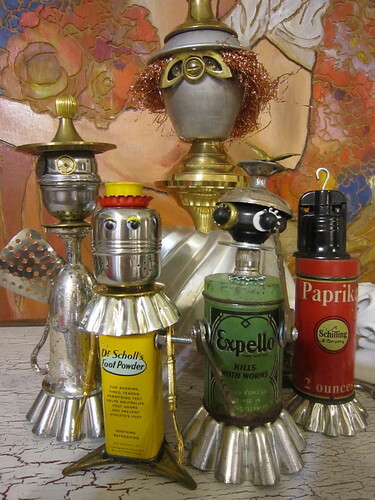 I can only take credit for the Dr. Scholls Robot, the rest of the awesome creations belong to the amazingly talented Fredda Perkins, AKA my mom. However, I fully intend to raid my own junk drawers and make a few more the minute I get back to Austin. Posted February 5, 2010 & filed under Crafts, I Love to Create, Recycled Crafts. Goodness gracious; these are adorable!! Just what I don't need; another obsession. Welllll, maybe one more. How much fun is your Mom!! Ya they are super fun and more importantly super easy. Vickie I'll trade you a robot summer camp day for another crochet lesson! I love that orange one. Now I know what to do with all the vintage product cans I collect! We've been saving stuff for robot making for a while. Thanks for reminding me to dig it all out. The kids can NOT have my cool tins, though!